Yesterday saw the release of a brand new episode of Barry Ritholtz’s Masters in Business, this time an interview with Aswath Damodaran. Some topics discussed are Tesla, Amazon, value investing, Warren Buffett and Benjamin Graham. I have transcribed the parts containing the discussions about Tesla and Amazon, both displayed below and ready to get read. Ritholtz: Let’s talk about two of the hottest companies out there, both of which seem to have a somewhat ambiguous valuation; Tesla and Amazon. So let’s talk about Tesla. You’ve done so much work on that. What is the bottom line with the valuation of Tesla? Ritholtz: Is there an Elon Musk premium? Damodaran: I think there’s an Elon Musk fandom. Which essentially… Tesla investors are not investors like other companies. They don’t invest in the company for the earnings and cash flows. They are not worried about the delivery schedules not being met. They are buying the Elon Musk story. Ritholtz: So there was just an article out the other day that Bloomberg released that showed among luxury auto makers; BMW, Audi, Mercedes, and others plus Tesla in terms of sheer volume last quarter Tesla’s beating everybody. Is that a fair statement? Damodaran: And I think Tesla has some incredible strengths, I mean, can you imagine another automobile company telling the world that they are going to come out with a new model in 2018 and 400,000 people signing up today and putting down… nobody else would do it. Ritholtz: And how about just the idea of someone saying; “I have an idea. Let’s make a new automobile company.” That hasn’t been done, in how many years, decades? Damodaran: And that’s why I feel frustrated with Tesla, because at the core it has something very powerful; this connection to customers that no other automobile company does. And the reason I’m frustrated is I want them to build this incredible great automobile company, I want focus here. Instead, what do I get? I get them acquiring Solar City and telling me that they are building battery panels and solar power. Ritholtz: Well, you’re gonna buy a battery pack, put it in you garage, put the solar cells on your roof, and now we’ve made you completely independent of the grid. Look what we’ve done for you as an automobile purchaser. Damodaran: And in a sense I think, once you’ve established yourself as an automobile company, maybe you wanna do this. But you already have enough on your plate. Why would you want to load up more stuff on your plate? Especially because I think Solar City is in a commodity business with a huge amount of debt. So it’s almost like you’re adding three distractions to a company that already has so much to focus on. If I was Tesla I would focus on getting the Tesla 3 delivered on time, because that’s gonna be disastrous cause you’ve got 400,000 people expecting the car to be delivered in 2018. And that doesn’t get to happen. Ritholtz: And this is the low-cost under 40,000 dollar every person, ever all electric automobile which ironically General Motors turns out to be ahead of Tesla with. First they had the Vault and they’re actually gonna beat Tesla to market. Damodaran: Yeah, but I think Tesla will win that game simply because General Motors want to go off to the fifteen, maybe the lowest… I mean Tesla will never be a fully mass-marketed automobile company because I think in a sense they will always trade at a premium over a GM car. So, I think they will have that price premium and and a profit margin. But all of that pre-supposes that they make the trades run on time. Ritholtz: Let’s talk about Amazon. I’ve mentioned that there was an Elon Musk premium. Is there a Jeff Bezos premium at Amazon? Damodaran: And I think it’s deserved. Amazon has been one of my pet obsessions for twenty years. It’s a company that I valued first in 1997, and I’ve valued it pretty much every year since. I tell people I bought Amazon four times, and I sold Amazon four times. Which kind of tells you where I’m at Amazon right now. Ritholtz: Have you regretted all the sells? Damodaran: No, because I think in a sense I have to stay true to my sense, which is I buy companies cause I think as an investor. The price has to be less than the value. Amazon is a company where the price can take off and go well ahead of value for extended stretches for years. And I think part of the reason I think people are willing to pay a premium is I’ve never seen a company where a CEO has been more consistent about his narrative. In fact, he’s the anti Elon Musk, right. If you go back to 1997 and you read the letter that Amazon sent to, I don’t know if you’ve ever read the Jeff Bezos… there’s a great letter that’s online where he told people what he would do as a company in 1997. And he’s stayed exactly true to the script. Ritholtz: And he’s done it all. There have been a handful of pewits but he’s pretty much been fairly consistent. There’s minor shifts of course changes, not wholesale reversals. Damodaran: In fact I describe Amazon as a field of dreams company, right. Which is, the story he told in 1997 is; “If we build it, they will come.” Basically he said; “Where gonna go after the revenues first. We’re not gonna worry about profits, and once we’ve built the revenues, the profits will come.” He’s stayed true, not just to that story in terms of what he said, but how he acts. You look at the Kindle, you look at… basically he goes product by product. Ritholtz: So let’s go through it. You have the Kindle. You have the Amazon Fire, Amazon TV, Amazon Prime is… I started the Amazon Prime a few years ago, I was late to the party and it’s just become indispensable. Amazon Music, Amazon Video. Ritholtz: Your colleague and NUY professor Galloway has been suggesting Amazon should go out and buy the U.S. Postals Service, cause their shipping costs are now in the billion, soon to be tens of billions of dollars. Damodaran: And you know what? If I was FedEx or UPS I’d be terrified of where Amazon is going next, right. Cause Amazon has this insane capacity to destroy almost every business for everybody else of the businesses. It’s done it in the retail business already. The reason I will be hesitant to buy Netflix is because Amazon is entering big time into that business. UPS and FedEx, you look at Amazon entering the business, and this is what Amazon does in every business they go into; they sell below cost. They challenge you to match up with them and they can keep going long after you’ve dropped out of the game. So, I think that they’ve got that right. There is change coming to this business. 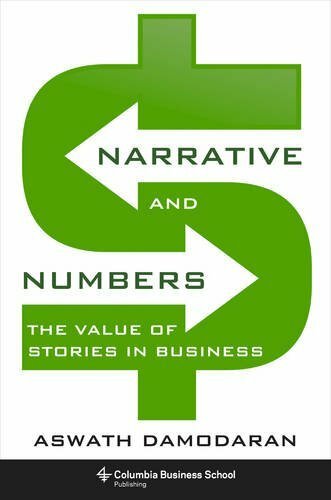 In the beginning of 2017 there will be a new book out from Damodaran called Narrative and Numbers: The Value of Stories in Business. Below the book description from Amazon. Looks like an interesting book, and one I will keep an eye on and catch up as soon as it gets available. How can a company that has never turned a profit have a multibillion dollar valuation? Why do some start-ups attract large investments while others do not? Aswath Damodaran, finance professor and experienced investor, argues that the power of story drives corporate value, adding substance to numbers and persuading even cautious investors to take risks. In business, there are the storytellers who spin compelling narratives and the number-crunchers who construct meaningful models and accounts. Both are essential to success, but only by combining the two, Damodaran argues, can a business deliver and sustain value. Through a range of case studies, Narrative and Numbers describes how storytellers can better incorporate and narrate numbers and how number-crunchers can calculate more imaginative models that withstand scrutiny. Damodaran considers Uber’s debut and how narrative is key to understanding different valuations. He investigates why Twitter and Facebook were valued in the billions of dollars at their public offerings, and why one (Twitter) has stagnated while the other (Facebook) has grown. Damodaran also looks at more established business models such as Apple and Amazon to demonstrate how a company’s history can both enrich and constrain its narrative. And through Vale, a global Brazil-based mining company, he shows the influence of external narrative, and how country, commodity, and currency can shape a company’s story. Narrative and Numbers reveals the benefits, challenges, and pitfalls of weaving narratives around numbers and how one can best test a story’s plausibility.